Striped Bass Fishing, It Doesn't Get Any Better! They are called rockfish, linesiders, and stripers, but the one thing these rugged and powerful fish are never called is boring. One of the things that makes striped bass such a favorite with anglers is the fact that they are anadromous, meaning they can be caught in freshwater (and also brackish water) as well as saltwater. The species can be found naturally along the Atlantic coast from Canada down to northern Florida. They are an exciting catch anywhere, but they are especially revered along the Northeast coast of the United States. In addition to these natural occurrences, striped bass, including hybrid striped bass, have also been introduced outside of their natural range over the years into many inland lakes by local fish and game departments across the U.S.
A separate but natural strain of striped bass also exists in the large rivers that drain into the Gulf of Mexico, and they have been abundant along the Pacific coast ever since their introduction into the San Francisco Bay in 1879. Though they spend most of their adult lives in saltwater, striped bass in their natural range migrate from saltwater to freshwater for spring spawning and can be caught in both environments. This fact allows for striped bass fishing in different seasons based on the migratory and spawning patterns. That’s right, striper fishing can be done in lakes and tributaries, in the open ocean and even along the surf on beaches. There are endless options when it comes to fishing this species. The striped bass fish can live 30-plus years (provided it is not harvested) and reach sizes of 30 pounds or more as adults. However, they can certainly get much larger than that. 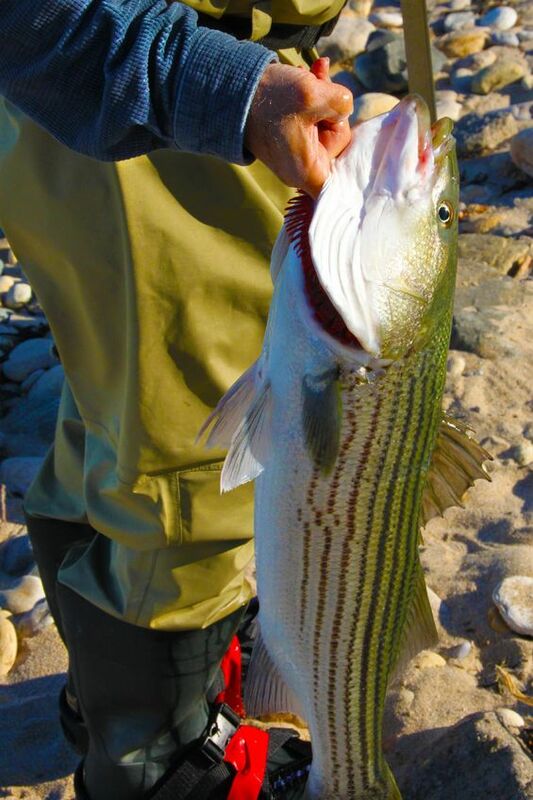 It is not uncommon to catch late-season “cows” (female stripers) in excess of 50 pounds in the bays and along the beaches of Cape Cod, Massachusetts, Block Island, Rhode Island or the holy grail of striper fishing – Montauk, New York. Striped bass are essentially schooling fish, so where there’s one there are usually more. They are often referred to as “linesiders”, a reference dating back to colonial times, because of the dark lateral lines running from front to back along the sides of the fish. The all-tackle record for striped bass is an 81 pounds, 14 ounces specimen taken by an angler off the coast of Westbrook, Connecticut on August 4, 2011, while night fishing. Planning ahead before embarking on your striped bass fishing adventure is a good idea. You may want to make a few assessments before casting your line: weather reports, high and low tide times, sunrise or sunset, mid-day or midnight, moon phases, water temperature, where to fish, the cost of gas, steel or fluorocarbon leaders, bait or lures, how did your fishing buddies make out over the past few days, or even how you have made out lately. But such considerations aside, being flexible and just enjoying yourself out on the water will make your search for big striped bass so much more fun. When fishing for striped bass in freshwater lakes and tributaries, most of the fishing will need to be done in deep waters of the lake. The one exception to this is if the bass are schooling. For deep water fishing, trolling works well and will be the most effective way to catch stripers. 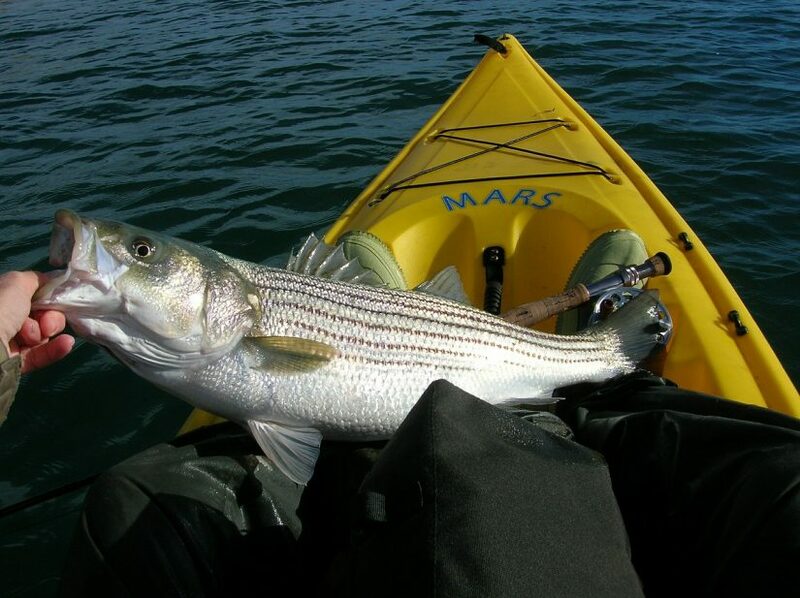 The striped bass can be picky about baits but will often go for live baits such as shad, shiners, and eels. For fishing with lures, the angler will want to use a deep-diving lure that resembles baitfish or even some of the newly developed jigs that are advertised to be for striped bass fishing. Many freshwater lakes now have hybrid striped bass that will provide any angler with an exciting outing on the water using a variety of artificial lures. One good piece of advice is that when visiting a new lake it is always good to stop in at the local bait shop and get information on what works well in the area. Saltwater anglers can attest to the thrill of reeling in a huge striped bass, or “cow”, in the open ocean. For the inexperienced fisherman or novice, a good first choice for fishing for striped bass might be to charter a boat and crew who know the local area well and can take you to the best spots to fish for them, as well as suggest the best techniques to use for that area. Chartering a boat may be a little more costly but will provide the best open ocean fishing experience. For people who are fishing on a budget another choice that might prove worthwhile is to go on a party boat. These boats take several people on a group fishing trip and provide all the equipment, bait and licensing needed. The angler will want to look at the boat’s offerings and make sure that striped bass is one of the targeted fish. One of the most popular methods for striped and one of my personal favorites is surf fishing. Many areas along the Atlantic coastline and even some on the Pacific coast offer great opportunities for surf fishing. When surf fishing, the angler will want to have the right equipment for the surf conditions, so make sure your gear is up to the task. Season and timing are also important factors to surf fishing for stripers. In the spring when you will be catching mainly schoolies, daytime fishing is most productive. Water temperatures are still cold at night during this time of year. During the summer, nighttime striper fishing is generally great, in particular for those really big ones. Most of my biggest striped bass catches have come at night… often as I’m getting somewhat sleepy. Autumn, or fall, presents a mixed bag of opportunities. Because striped bass begin their voracious feeding in preparation for the long migration south for the winter, you will be able to catch big bass almost any time. A twenty to forty-pound test monofilament line with a ten to twelve-foot surf fishing rod will provide the basics. Live bait, which is available in the local area, will usually prove to be the best. Clams or mullet seem to work great as these are what the fish feed on much of the time. 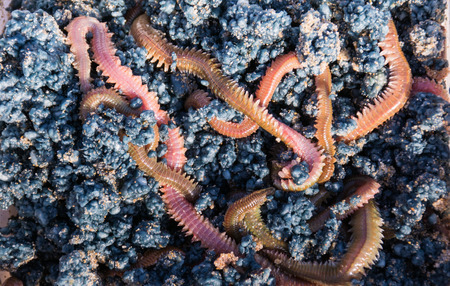 On Cape Cod beaches, anglers are very successful using live eels. It is always a good idea to chum the water as this will draw the big fish in. You will want to drop your line out beyond the third or fourth wave. Some people have found that small fishing/float tubes allow the fisherman to get out a little bit deeper especially in areas with sandbars. Don’t ignore one of the most important pieces of gear in your tackle box – your fishing line. Make sure you have a good, strong line to catch that big striper (12 – 40 pounds test depending on conditions). Test your knots with strong, steady pulls, and look for any possible breaking points. You can use mono but I like braided lines because they are strong while thin, and they let me instantly feel the hit from the fish. There are different rigs that can be used for striped bass fishing, but the most common usually consist of a large sinker that is attached to a slider with a 2-3 ft. leader in the 30-60 lbs range and a 5/0 to 7/0 J/bait holder hook. Some folks prefer circle hooks to avoid the chance of gut-hooking the fish. Whether you are wading up a crystal clear creek or trolling a sparkling lake, searching for striped bass can be a wonderful way to spend the day enjoying the outdoors. While you can certainly catch plenty of fish with lures, In my opinion, live bait works best when fishing for big stripers. The best baits are what the fish have available to them locally. Clams, sea worms, live or dead bunker, mackerel or porgy and, of course, the go-to striper bait, live eels! Stripers are known for their firm texture, moist, flaky white meat, and mild flavor. They also tend to be a lean fish that can be deep-fried, baked, broiled, blackened, grilled or smoked. Grilling is a favorite cooking technique for stripers (though it is a fish that also lends itself well to other methods, as mentioned above), leaving the skin on the fillets while using a well-oiled, grilling basket for fish to hold the tender meat together. We grill masters understand the importance of starting with a good, clean grill and oiling it well. We definitely don’t want the fish to start sticking, because once that happens you are pretty much lost, particularly with smaller fillets that don’t hold up as well on the grill as thicker cuts of fish. Another point: don’t overcook your striped bass! Not only will it dry out, but it will stick no matter how well oiled. Flavor-wise, striped bass is a mild and delicious fish that does not require over-seasoning. 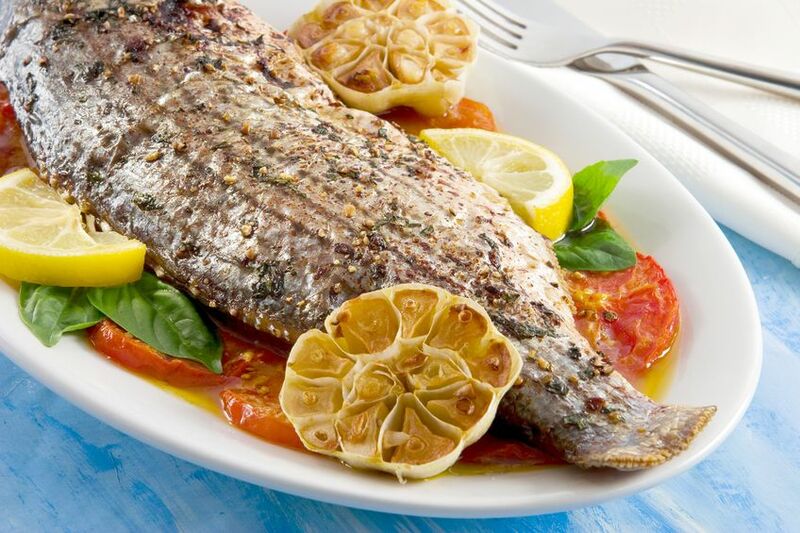 Don’t overpower it and you will be able to savor the great flavor of this fish. Lightly brushing some oil over the fish (I like olive oil) will prevent it from sticking to the grilling basket. This will also help to hold some light seasonings in place. Returning from a day of great fishing, just ask your fishing guide or charter captain for their favorite striped bass recipe – I’m quite sure they would love to share one or two with you. Striped bass rank high with the very best of game fish for the versatility they offer the angler, the sheer thrill of the fight they put up and, finally, for their contribution to delicious table fare for those who love tasty fish. This entry was posted in Bass Fishing, Fish Species, Freshwater Fishing, Saltwater Fishing and tagged how to catch striped bass from shore, how to cook striped bass, how to fish for stripers on April 6, 2017 by Avid Angler.